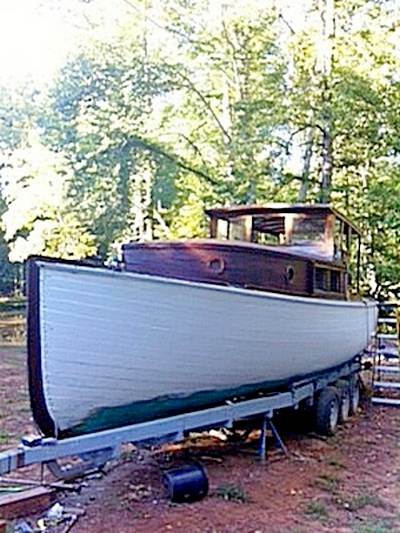 Just got a 1931, 32 ft trawler from the Wick Bros boat yard Amityville New York. We got the motor running, had to rebuild the exhaust manifold from galvanized parts. In dry on trailer sure turned a lot of heads coming down the road. Pulled in my drive the bell started ringing letting my wife know I was home with another boat. I have a pond in the lower yard and built a boat ramp to get boats into the water. As of now I have two boats in water. A 1976 Revel 26 ft and a 22 ft Cobia. 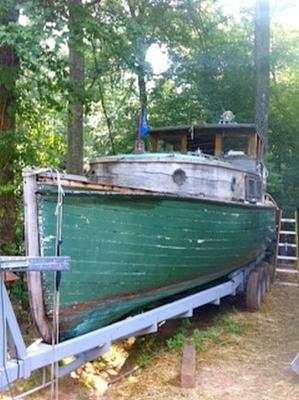 I also rescued a 26 ft 1967 Chris Craft Caviler from the wood chopper. You could say I have a few projects om going. I just call them my floating man caves. Wow , that looks like a special boat to me. Classic boat through and through. More pictures of Teal would be nice ! What engine does Teal have and is it the original power? I am researching a book about the residents of Ocean Avenue, Amityville. Would love to get hold of biographical information on Frank Wicks and his boat yard. I know TEAL very well send me an e-mail and we can talk more. Hi, sure looks like an Elco Cruisette to me. The deckhouse windscreen and all was probably an add on. They just had a simple pipework type canopy originally. My father worked at the boat yard as a child. His grandfathers name was Will and his uncles name was Ollie. I would suspect that on the 4th of July just a few years ago there were a few libations consumed aboard her somewhere on the Great South Bay. Have some more for the prior owners of her. Happy 4th to you and nice job you are doing. 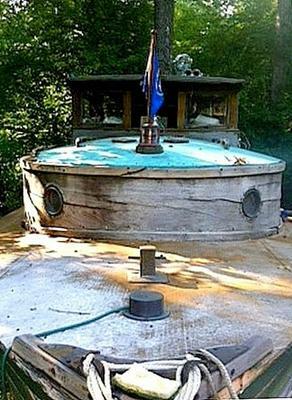 We kept her on the Amityville River for over 40 years, just half a mile from where she was built. I would love to hear more history from you side too! Ill send you a PDF file of pictures . The only info on wicked I've gotten is from some real estate guys I called about Amityville boat yard. The old timers said it was long gone, even the canvas maker was out of business. Speaking of canvas did yours have a sail? It was very small mostly used for stabilization rather than power I'm thinking of adding another boom for second sail. What bottom paint did you use? I found a brand antifowling teal color. I'm missing a board on bow, I knew it needed one. It would be great to talk, email you about our project. I'm in final stage of caulking and hope to bottom paint soon and re-float. This Charlie loves your "Charlie". You might want to get in contact with the Amityville Historical Society in Amityville NY. They might have some good leads, etc for you. I too have recently acquired a 1931 Wicks Brothers. Her name is 'Charlie' and we're just getting into our second winter of restoration. Last winter was spent stripping exterior varnish, sanding, re-varnishing, repairing a rotted foredeck, new fuel tanks, new distributor cap, new water pump, bottom/topside/deck paint. 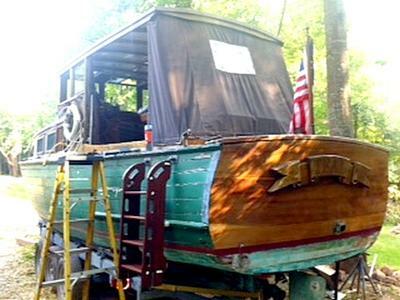 This winter will be interior varnish, interior paint and some new interior cabinetry forward of the head. She's currently on the hard at Newport Shipyard. Great family boat. We're based in Newport, RI. 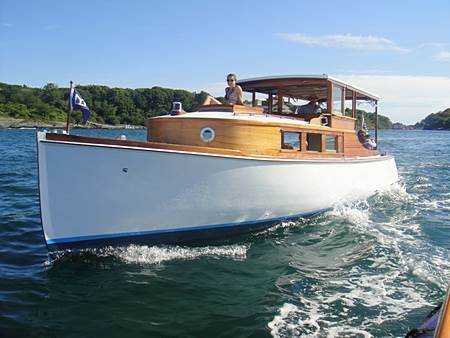 Do you have any information you could e-mail me about the Wicks Bros. boatbuilding operation? How many did they build? Starting when and to when? Sorry, I don't have any photos but I'll check if any friends have any. Great to hear of old memories. Hope to make some new ones in the old girl. Do you have any pictures of teal in her day or any other wicks boats? I grew up in Amityville and saw a lot of Wicks boats. Go out for a day on the water. Little kids rocked to sleep in the pipe berths. Ice in the icebox to keep the beer cold. Run over to Gilgo, etc and walk across to the ocean. Anchor or drift and throw a line overboard. Didn't matter if you caught anything. Slip up next to a sandbar and go clamming. Speed isn't necessary when you are out on the water in a good boat with good friends. You'll enjoy her as much as her anonymous previous owners. 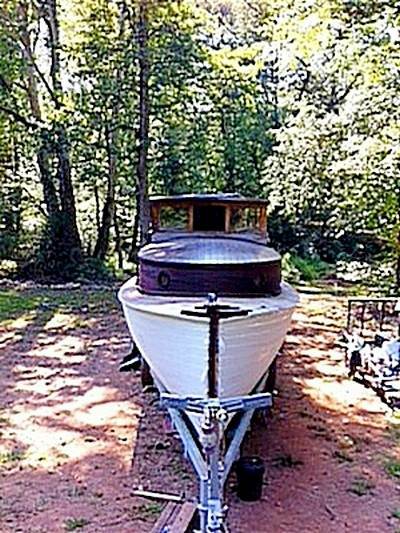 She could even be my aunt's old boat...If you see the impression "Two Hoops" on the transom she's my aunt's old boat. You are a lucky person to have found her. I'm trail testing an elastomeric roof paint on canvas to recover roof decks on "Teal". I'm going to tint it to teal green copper color like original. It has a 350% stretch plus r value. I'm going to prime backside of canvas first then install so paint doesn't bleed through the canvas. Here are some new pictures for Teal , primed and caulked ready for paint. I'm going to soak her in my pond before I take her out on big water. Teal top side, I like wood but think I'm going to put back the canvas or I did find an insulated vinyl cover that goes on rvs that might be better choice? The green paint was latex over the white. I'm having to use a cotton rope with the cotton strand to fill bottom boards. The walk around had been fiberglassed so I'm going to re resin it and paint with anti-skid. Also I found a rounded blade that will fit a reciprocating saw that is good for removing old caulk and cotton just be careful and don't let it jump out of joint. It shows no mercy to surrounding wood. The bottom paint looks like copper paint. It also looks like it was never primed before. The copper paint is hard to get off, so, do I keep scraping and prime before repainting with copper bottom paint? Or just scrape and repaint? Sanded back to white , also removed rotting canvas roof tops sealed with cabots Australian timber oil. Yes you could say I'm addicted all boats were free so it's all a labor of love. 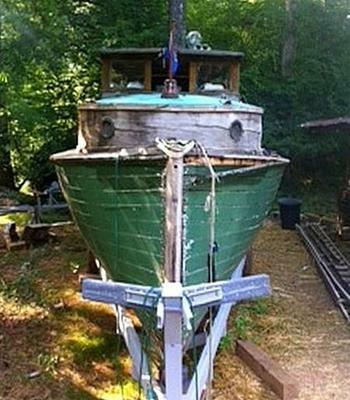 Does anybody have info on Wicks bros boats out of Amityville New York? We thought it was a wheeler trawler at first - like Ernest Hemingway's "Pilar" which I saw one like it in Islormada in the Keys. If you have any photos we’d all love to see them. You can email them as attachments to me at mike@diy-wood-boat.com and I can do any resizing etc and add them to your post.